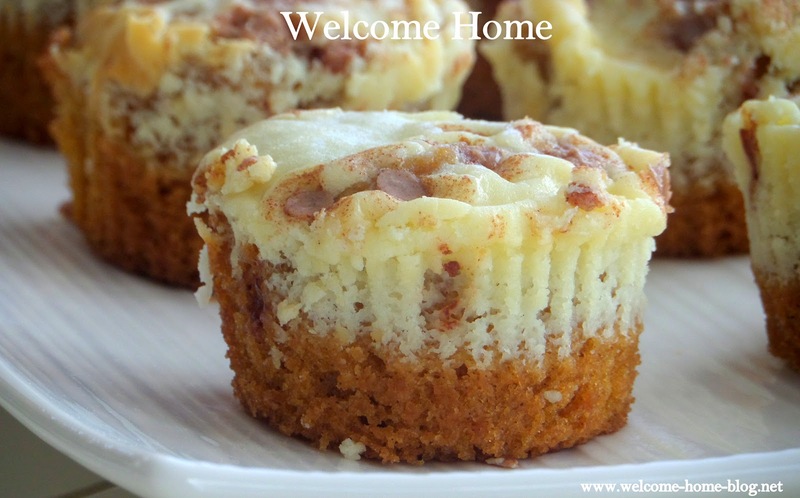 I love these little moist pumpkin cakes with a creamy cheesecake filling. I made them over the weekend and packed them up to freeze for Thanksgiving...not without having a few first! You'll love these! To make the cakes, preheat the oven to 350 degrees and line small muffin pans with paper liners. In a medium bowl, combine the flour, cinnamon, nutmeg, cloves, pumpkin pie spice, salt and baking soda and blend well. In the bowl of an electric mixer combine the eggs, sugar, pumpkin puree and oil. Mix on medium-low speed until blended. With the mixer on low speed, add in the dry ingredients, mixing just until incorporated. Fill each muffin tin about 2/3 full (about a tablespoon or so) with batter and then add about a teaspoon or so of cheesecake filling on top. To make the topping, combine the sugar, flour and cinnamon in a small bowl; whisk to blend. Add in the butter pieces and cut into the dry ingredients with a pastry blender or two forks until the mixture is coarse and crumbly. Sprinkle each cake with with topping and bake at 350 degrees for about 12-14 minutes. Very addicting! how many does this recipe make? i did exactly as stated and had a lot of cream filling left over! baking them up now. I got two 24 mini muffin batches out of this recipe, using a little more batter and filling than called for. But ended up with a ton of extra topping. Yummy, but more breakfast like than dessert. Made this tonight. Turned out great! I also got two batches of 24. I had some leftover topping but not a lot. I used pumpkin that I pureed myself. If you do that I recommend straining the pumpkin through cheesecloth first otherwise it will be too runny. I will definitely make again. Thanks for the recipe! If you Google "1/2 cup of pumpkin puree recipes" you will find a bunch of ideas! I have a Libby's canned pumpkin, but it's not purée. Do I need to do anything else? It's best to use the Puree in a can as the recipe calls for.